HAMMONTON — Senate President Stephen Sweeney said Friday he wants revisions to the school-funding formula in place for the 2017-18 school year. 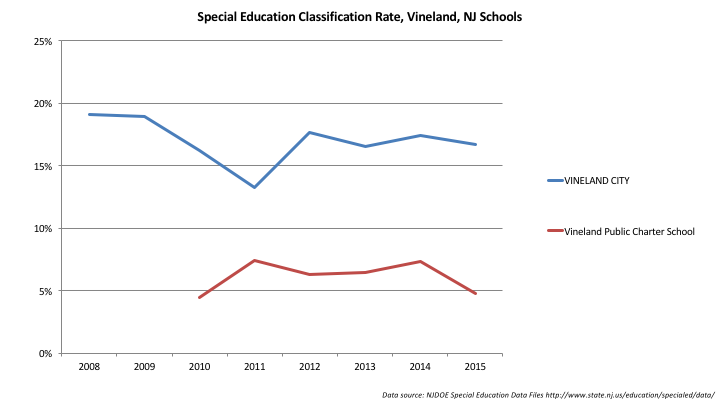 Helen Haley, the business administrator for the Vineland School District, said they would lose money under the proposed revisions, and it would be devastating for the district, which is among the poorest in the state. Sweeney said special education is an area that must be addressed, and the district could get additional aid there to make up for losses in other aid. 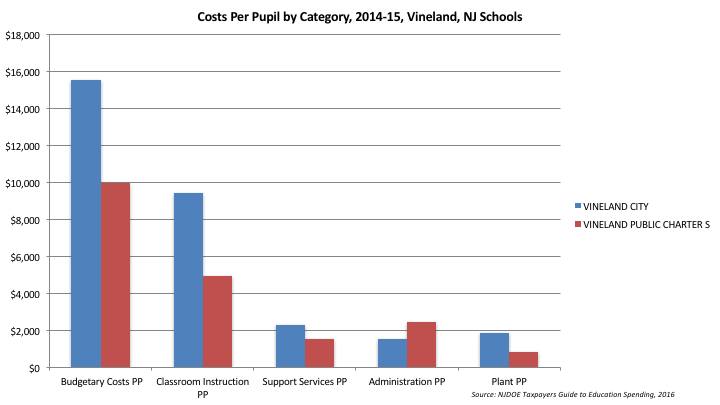 But I do know this: Vineland, like all other New Jersey school districts, should be seeking to make its schools systems as fiscally efficient as possible. 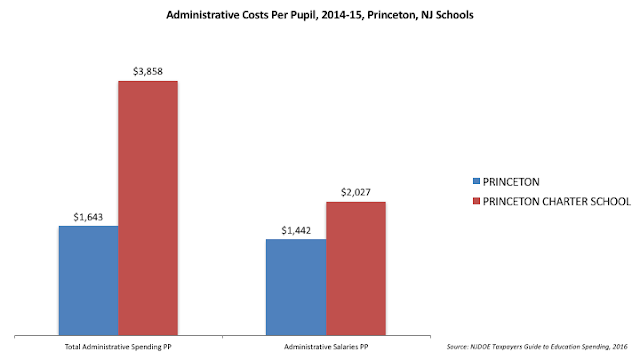 If funds are scarce, and if taxpayers want the maximal value for their investment, school systems should keep administrative costs low and get as much money "into the classroom" as possible. 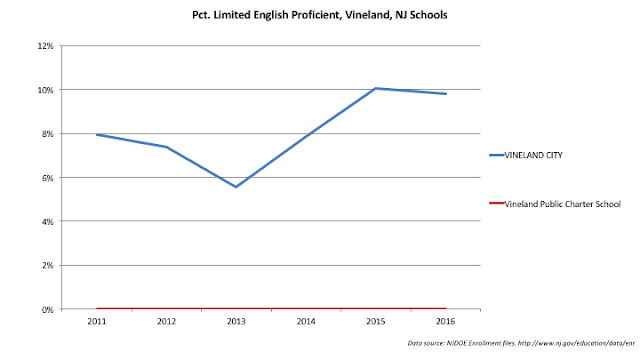 Which brings us to the Great NJ Charter School Rush of 2017, and the NJDOE's push to approve as many charter school expansions as possible before Chris Christie's term ends -- including the Vineland Charter School. The report states that Garcia held positions in five school districts in 2010-11, earning almost $300,000. That is not illegal, but an attempt to alter one of the contracts during the investigation could lead to future sanctions. Garcia worked full time as the school business administrator in Winslow Township, earning $156,375 in 2009-10 and 2010-11, according to the state report, obtained by The Press of Atlantic City through the Open Public Records Act. 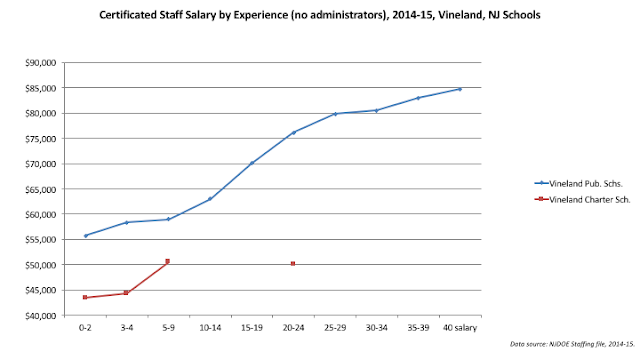 In those two years she was also paid to be the executive director of the Vineland Public Charter School, earning $50,000 in 2009-10 and $60,000 in 2010-11. She also served as the part-time business administrator for two other charter schools, the Charter Tech High School for the Performing Arts in Somers Point, where she earned $54,080 in 2009-10 and $56,243 in 2011-12, and the Environment Community Opportunity Charter School in Camden, where she earned $22,000 in 2009-2010 and $18,640 in 2010-11. She also served as the appointed treasurer for the Voorhees school district, earning $6,780 in 2009-10 and $6,900 in 2010-11. Colleen Schulz-Eskow, of the Department’s Charter School Office, testified that it was common for business administrators – but not lead personnel – to work at multiple charter schools. 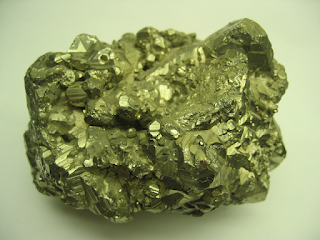 6T52-53. Since she was aware that – at the time VPCS was starting up – Murphy-Garcia was doing business administrator work at other schools or districts, Schulz-Eskow questioned Murphy-Garcia about whether her time and commitment to VPCS would be sufficient to adequately oversee the school. 6T44-47. Ultimately, when the DOE approved VPCS, they were not worried about Murphy-Garcia being at the school on a part time basis. 6T55. It is not clear to the Commissioner, however, whether Schulz-Eskow was aware of how many schools employed Murphy-Garcia. If she was, it appears that she did not share the concerns of her Department of Education colleague, Martin, about the implications of Murphy-Garcia’s multiple employment. However, as a matter of common sense, the Commissioner must register misgivings about Murphy-Garcia’s – or anyone else’s – ability to actively devote to each of five employers the respective number of hours of work which were promised them. It is likely that such a concern motivated OFAC’s continuation of its investigation into Murphy-Garcia’s employment. 4/16/15 -- VINELAND – Vineland Public Charter School families are waking up today to the possibility the school may not have a place to call home come September. After hearing close to three hours of passionate testimony, the Zoning Board early this morning issued a resounding rejection to a request to allow the charter school to lease space at the former Wallace & Tiernan factory at 1901 W. Garden Road. Boiled down, members agreed with municipal staff findings and argument from opponents that the board's priority should be to uphold a quarter-century of city development strategy and investments. Charter school Executive Director Ann Garcia, who testified extensively at the prior meetings, did not at the final hearing. However, Garcia made her presence known with loud comments and fidgeting from the front row of the audience area during a Magazzu-Stanker exchange. Garcia has acted similarly at previous meetings. The display irritated board chairman and Solicitor Frank DiDomenico, who chastised her and suggested she should leave if she could not keep quiet. Garcia responded to LoBiondo that she might go and she did leave a few minutes later. She returned as the board started its voting process. Greenberg noted that the city's principal planner had found that a school in an industrial zone was a significant problem. Another reason she gave was testimony from the charter school that the factory would provide room for an expansion to accommodate a high school. The commissioner of the N.J. Department of Education in March denied that expansion request. He laid out why in a letter sent to Garcia. The executive director was asked at the last meeting, under oath, to explain the letter and the commissioner's reasoning. So the NJDOE approved VCS's expansion in 2013, even though they were conducting an investigation. In 2015, they found, according to this report, "organizational weakness" in the school. And yet expansion plans went ahead, including the building of a new facility last year. 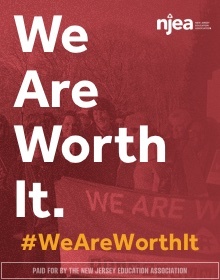 That facility, and five others in New Jersey, has been financed by Highmark School Development, a Utah-based company that, according to this report, loans funds to aligned non-profit corporations, who in turn build schools which they then lease to a charter. As Bruce Baker and Gary Miron have pointed out, this practice essentially uses taxpayer funds to put school facilities into private hands. If this facility was being built by the Vineland Public Schools, the taxpayers would own it. That isn't the case here, even though the taxpayers, through payments to VCS, are footing the bill. 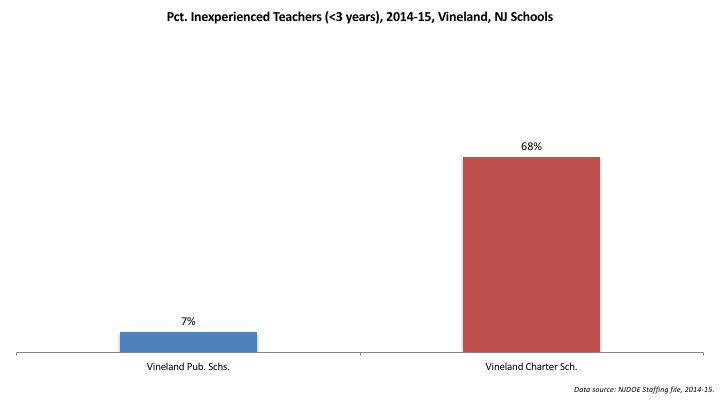 VINELAND - Transportation issues with the Vineland Public Charter School could cost the district about $400,000 not included in the 2016-17 budget, the district’s transportation director told the school board Wednesday. It’s a problem the school district brought upon itself, said Ann Garcia, VPCS executive director. “The charter school is a very fragmented business right now; they are supposed to be in one location within the City of Vineland and they are in four locations, one being in Millville, which created a transportation problem for us,” Joe Callavini, the district’s transportation/registration coordinator, told the board Wednesday. 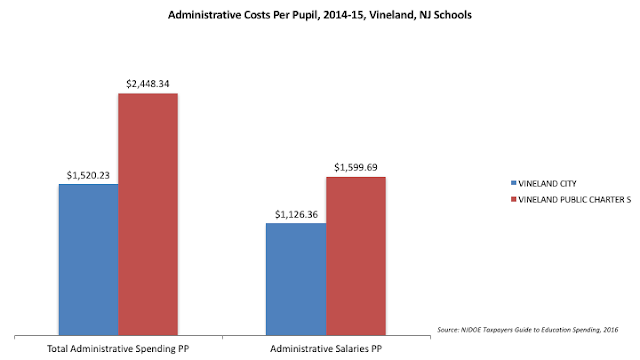 There's a lot of he-said/she-said here, but the central point is that VCS is creating many extra costs for the taxpayers of Vineland, and New Jersey as a whole: the redundant administration, the building of extra facilities the public will not own, the addition transportation costs, and so on. 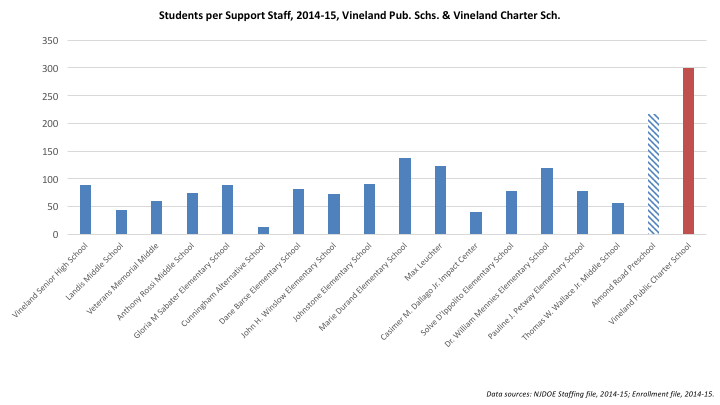 If Senator Sweeney and any other stakeholders are interested in saving money on schools, they should be asking if the "gains" Vineland Charter School gets are worth the costs of its expansion. VCS and Vineland Public Schools had close to the same proportion of free lunch-eligible students in 2011. The gap, however, has grown in recent years. 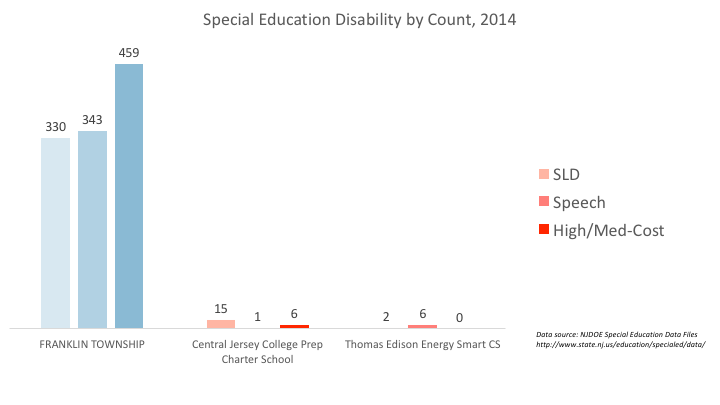 And, like so many other charters, VCS educates a much smaller proportion of special needs students, year after year. 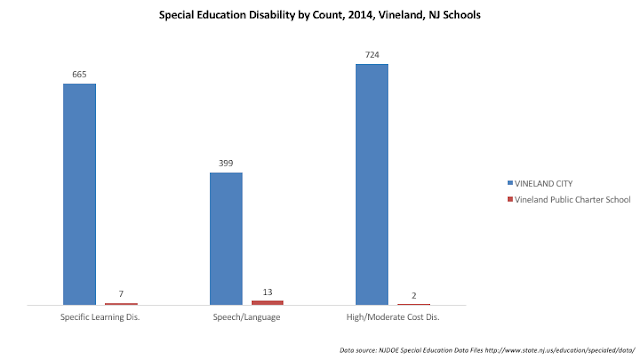 The few special education students VCS does take have lower-cost disabilities. This concentration of higher-cost students puts a strain on VPS. I'm glad to see Senator Sweeney acknowledge special education funding is important, but does he understand the effects of this type of concentration, thanks to charter schools? 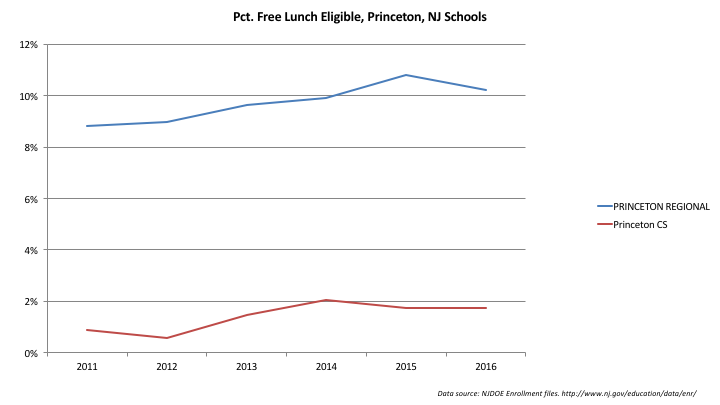 Once again, we have the "free rider" problem for VPS: because charter teachers know they can make more if they transfer to a public district school later in their careers, they are likely more willing to take less money at a charter where they start their careers. VCS, in other words, gets away with paying their teachers less because those teachers know they can transfer out in a few years and make more money. How does VCS spend its funds? What's interesting here is that VCS spends much more on administration than VPS -- as is typical for charter schools -- but the gap closes considerably when looking only at salaries. Are VCS payments to Highmark going to come in this category? If we take their preschool out, we find VPS has many more support staff per student than VCS. Again, that's a function of VPS having many more classified students on their rolls. 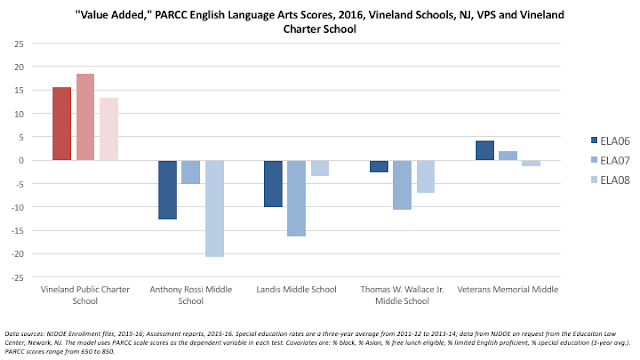 So there's the cost for Vineland to maintain a charter school: higher administrative costs, lower teacher salaries, fewer experienced teachers, and student segregation by educational need. The "value" that VCS adds is on the order of 10 to 15 points in Grades 3 and 4 -- on a test that has a range of 200 points. Is that impressive? 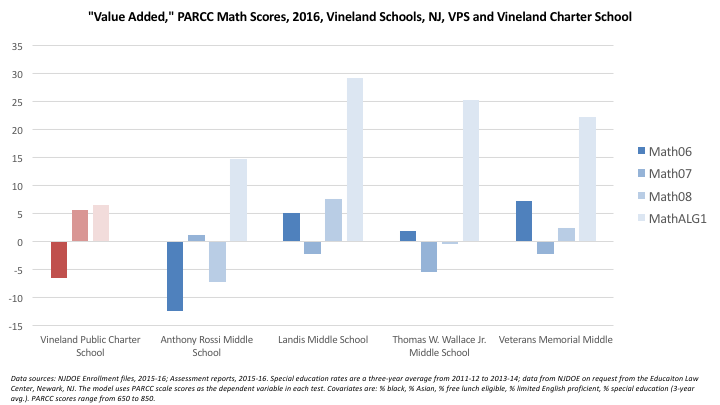 Considering the mixed bag in VPS schools, and the low value added in Grade 5, I'd say it's a decent showing, but hardly a superior outlier. 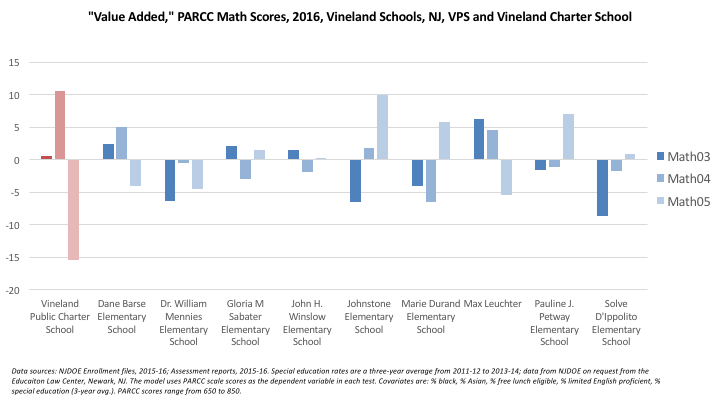 VCS adds no value in Grade 3 math, does well in Grade 4, but then plummets in Grade 5. When you see inconsistent results like this, it's reasonable to assume that the school's instructional practices aren't the major factor: more likely, peer effects, self-selection, and unobserved student differences are driving the results. Not a great showing in Grade 6, and little advantage in Grade 7 and Grade 8. But wait -- what about Algebra 1? Doesn't VCS offer it to their students? According to the data files, no scores were reported for VCS in Algebra 1 -- which is odd, because there were scores reported for Grade 8 Math, which is the test students take if they aren't taking algebra. So data suppression isn't likely the issue (although I can't say for sure). Notice how well the VPS middle schools do in Algebra 1? You might think that's a function of good instruction. I'm not saying VPS doesn't do a good job, but there's really another explanation: kids who take algebra in middle school instead of high school are much more likely to do well because they wouldn't be enrolled if the district didn't think they were talented in math. But the data doesn't sort students according to their "talent," or "ambition," or whatever. Which, again, is a critical point to understand about charter school "gains": Self-selection sorts students on characteristics we can't observe, meaning the charter students, on average, are not the same as the public district students. So when you see inconsistent gains, like here, ask yourself: is this an indication of school success, or of student success? Senator Sweeney says the Vineland Public Schools should have been making plans for years in anticipation of a funding cut. OK... but VPS has no say over charter school approval or expansion. If the VPS school board knew cuts were coming, would they have approved a charter school that spends much more on administration, free-rides on staff salaries, builds facilities that the district will never own, segregates students by special need, and gets, at best, inconsistent test score gains? If Senator Sweeney is serious about getting school budgets under control, he would do well to step back and think a bit about whether NJ school districts and the state can continue to subsidize charters like Vineland Charter School while simultaneously demanding their host districts lose state aid. Maybe the NJDOE's rush to approve as many charters as they can before the end of the Christie era is worth a bit of the Senator's attention. I was in Franklin, NJ a few weeks ago for a panel on charter school expansion. The town already has two charters, and a third is in the works (founded by, of all people, a winner on The Apprentice). One of the schools currently open, Central Jersey College Prep Charter School, has been granted a huge expansion by the NJDOE. 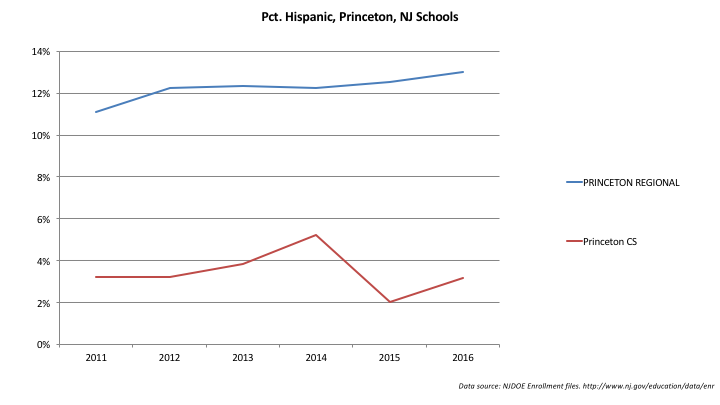 This expansion is part of what appears to be a rush to swell charter enrollments across the state before Chris Christie leaves office next year. What's so discouraging about the Franklin charter expansion is that the community has been split apart. The charter families feel they have been served well by their schools, and want to see them grow. The families of public district school students, on the other hand, rightly worry that the charters are harming their district's finances. This tension is being played out across the state and across the nation: charter families' demand for "choice" inherently conflicts with public district school families' demand for adequately funded schools. There are also the interests of other taxpayers, who want efficient schools and worry that charters, because they are redundant and usually inefficiently small, waste funds that could be used to either expand programs or reduce taxes. 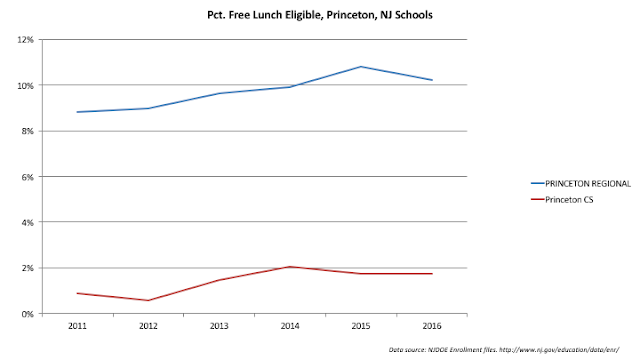 The conflict is so great that citizens in towns like Franklin are now bringing civil rights complaints against charters, alleging the charters enroll a fundamentally different student population than the district. There is no doubt they are correct: While it may not be intentional, Franklin's charters do not enroll the same types of students as the district. 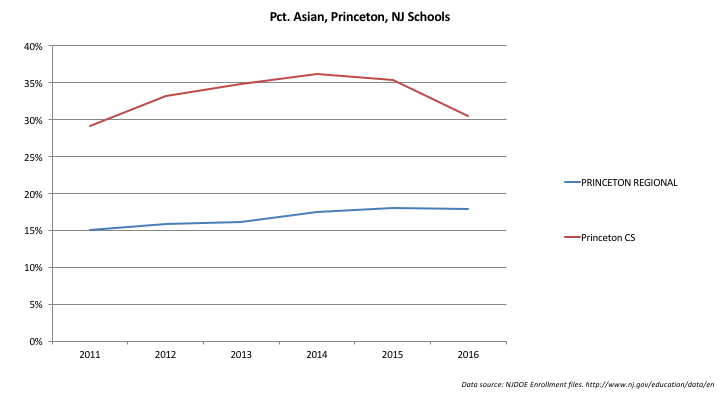 Thomas Edison EnergySmart clearly has many more Asian students and many less Hispanic and black students proportionally than Franklin Public Schools. 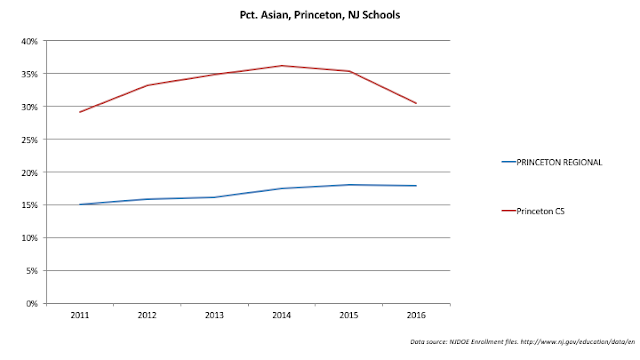 Central Jersey College Prep is trending away from the district. The charter advocates in Franklin have made the case that they don't discriminate because their lotteries are open to all. They neglect to mention, however, that sibling preference can contribute to segregative patterns. Further, we know from a large and growing body of evidence (see the lit review here) that parents negotiate school choice systems differently, and that distance and social networks play a large role in how their children eventually wind up in their schools. This slide shows that TEECS recently moved from a census tract where 32 percent of the population is black to a tract where the black population proportion is 10 percent. CJCPCS is in a tract where the black population is 7 percent. I don't know how this can possibly help the schools become more integrated. As is typical for New Jersey, Franklin's charter schools enroll far fewer special eduction students. The few special education students the charters take tend to have low-cost disabilities, such as specific learning disabilities (SLD) or speech disabilities. 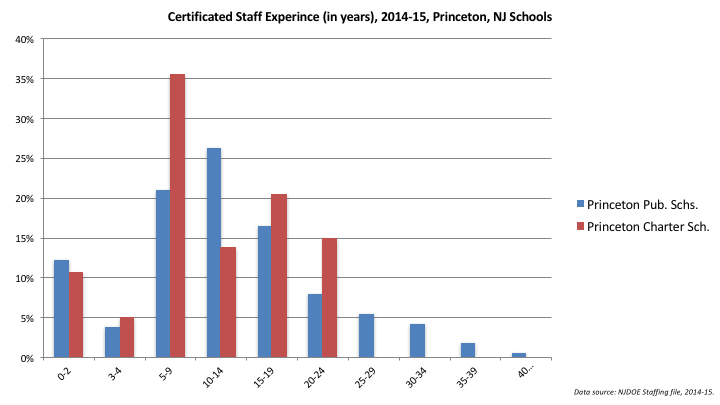 Charter teachers have far less experience than public district teachers. 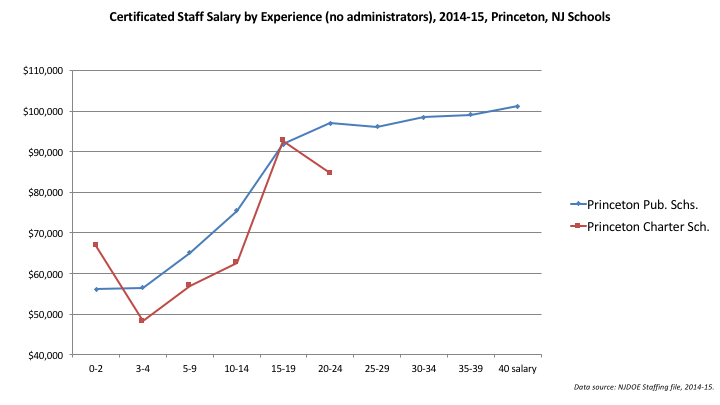 As Martin Carnoy recently pointed out, this creates a "free rider" problem in staffing (more on this later in the series). Charters spend far more on administrative expenses, likely because they can't achieve the economies of scale found at public district schools. Let me add a few thoughts before I share these last two slides. There's been a lot of study and debate about the alleged charter school "advantage" -- whether charters get better test scores than public district schools. 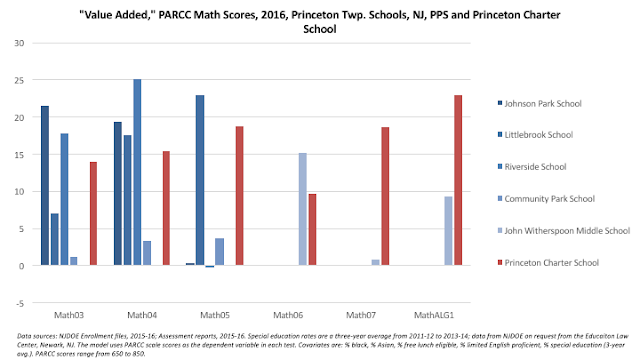 As I have pointed out time and again, it is simply wrong to compare test scores between any two schools without controlling for their differences in student characteristics (and if we want to be really thorough, we should also take into account differences in spending and other resources). But there are other issues when comparing charter and public district outcomes. 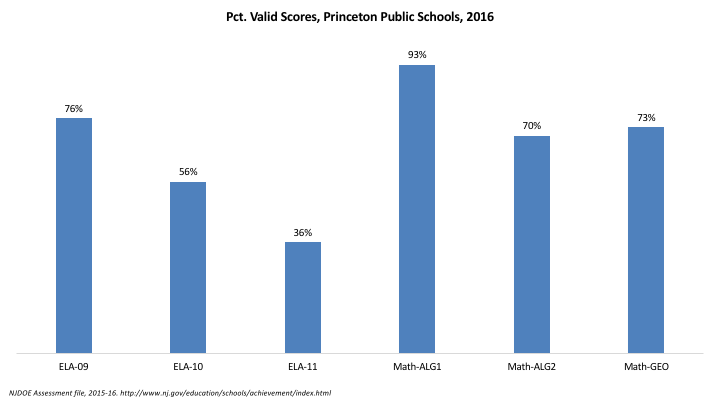 Comparing proficiency rates, for example -- as the Franklin charters did in a handout the night of the panel -- masks all the growth that takes place for students who are above or below what is basically an arbitrary cut point. And even growth measures like SGPs are problematic, because they equate growth at different parts of the test score scale. 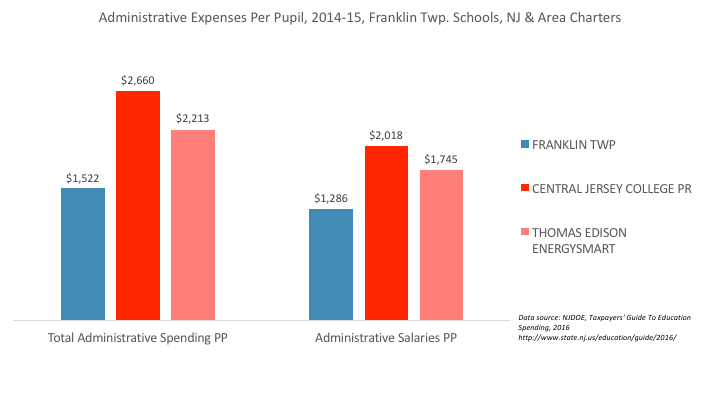 Looking at this, it's clear Franklin's charters have an advantage... but is it really that great? 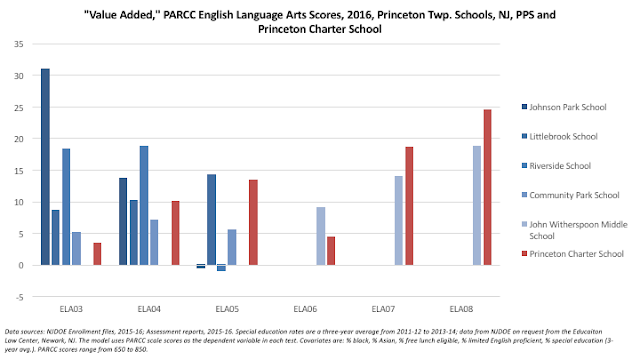 Is 20 to 30 points on a test with a 200-point scale really earth-shattering -- especially considering the charters enroll far fewer students with special needs? If I had to point to one particularly striking finding, it's that Franklin Middle School does exceptionally well with its Algebra 1 students. But even then: these are the kids taking algebra in Grade 7 or 8, as opposed to the kids who take it in Grade 9 or beyond at the high school. Is anyone shocked by this difference? 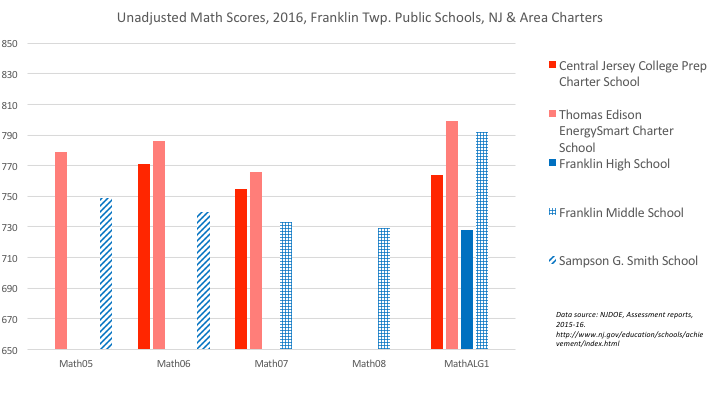 Which is really the larger point in all of this: If test scores are so dependent on student characteristics, what, then, is being gained from separating Franklin's students into different school governance systems? Is it really so important to sort the kids into these different school communities? Shouldn't Franklin value having all of its students together? Is individual achievement the only thing the community should care about? 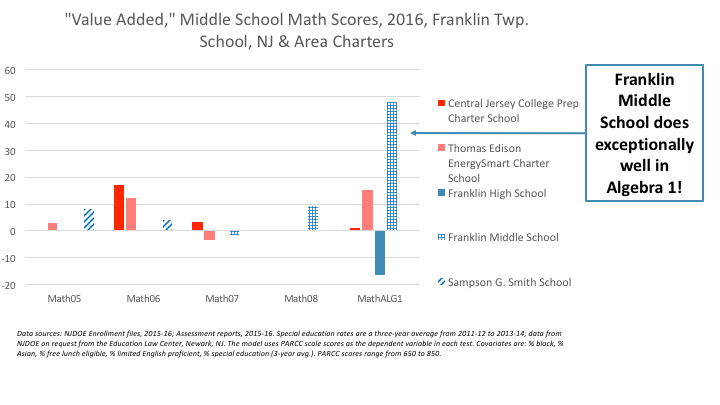 There's another issue that is particular to Franklin: Northjersey.com recently reported that the charters are linked to the Turkish Gulen movement. According to the Philadelphia Inquirer, Fethullah Gulen himself pointed to a network of charter schools in the United States to obtain his green card. Are Franklin's charters in fact part of this network? Who are their vendors? What lease deals do they have? These are questions that public school boards have to answer regularly as part of normal standards of transparency and accountability. Yes, the system does break down -- I am the first to point this out. But charters don't have to answer to the taxpayers in the same way public district schools must. 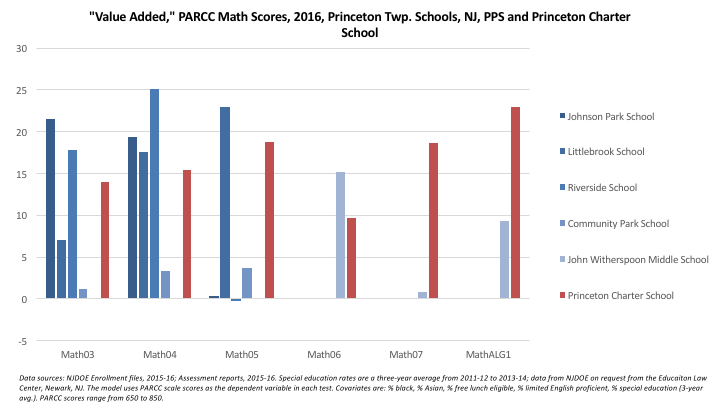 Are relatively small, inconsistent test score advantages worth the costs of increasing segregation, redundant and inefficient school management, a relatively inexperienced teaching staff, and lower standards of transparency and accountability? I won't answer that question -- because the people who should be making the decisions about charter proliferation are the people affected by those decisions. 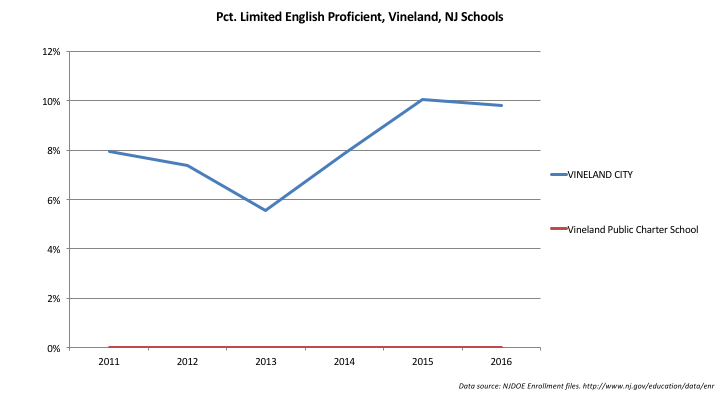 But Chris Christie's NJDOE has the only say over charter approval and expansion; the local school board, elected by the town's citizens to ensure the delivery of a quality education for all students, can go hang. “This is less about your choice and more for us about the rapid expansion, the number of dollars we spend now and the potential number of dollars that could be spent,” he said. In other words: The "choices" charter advocates crave come at a price for other students and for local taxpayers. Districts have fixed costs and must enroll all of the students who are not attending the charters -- students who are more likely to have needs that require more revenues. Taxpayers must come up with the additional funds to support redundant school systems, without any say in the extent of charter proliferation or the benefits of increased accountability and transparency. Trust me -- we are going to see this set of circumstances time and again as we travel across New Jersey. Next stop: Princeton. Chris Christie begins his last year in Trenton as the least popular governor in the nation. But that doesn't mean he still can't impose his will on New Jersey; the governorship here is one of the most powerful in the nation. So even though many communities throughout the state may not like Christie, he can still act against their wishes and jam through any numbers of policies in his last year simply because he can. 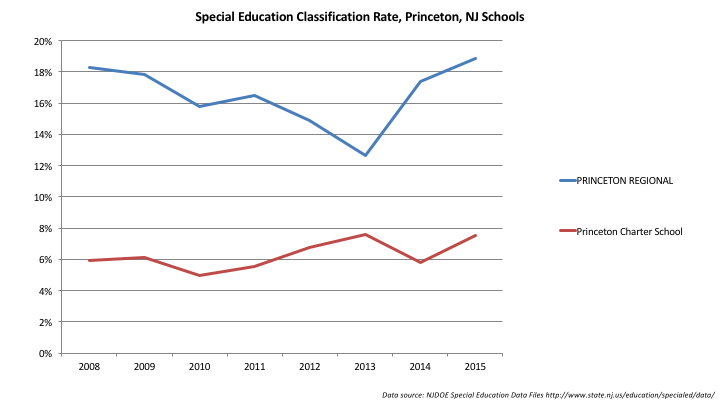 Trenton, NJ – The New Jersey Department of Education (NJDOE) is announcing decisions on new public charter school applications, charter renewals, amendment requests for expansions, and closures. Sure, it reflects Christie's commitment to charter schools -- no matter what local communities may think. 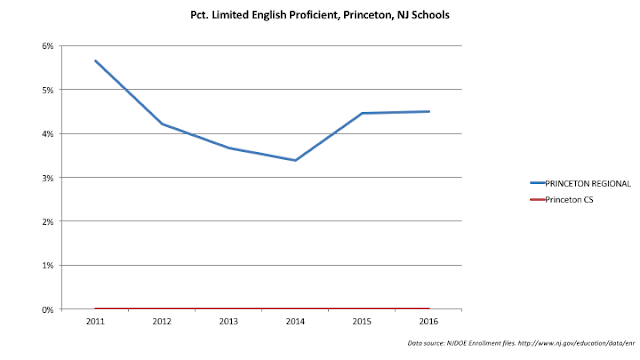 As regular readers know, New Jersey charters are only answerable to the NJDOE, which is under the direct control of the governor. Local school boards have no say in charter approvals or renewals, even though they must fund them -- no matter how damaging those charters may be to the local public schools. The greatest fiction produced by the New Jersey charter school industry -- and, for that matter, charter cheerleaders nationwide -- is that charter school funds simply "follow the student," and have no impact on district finances or programs. This is nonsense. Charters are self-contained, redundant school districts that are usually so small that they can't leverage economies of scale. Empirical research shows charters have had detrimental effects of the finances of districts in New York State and Michigan. Furthermore, while there is variation across the nation, Bruce Baker and I have shown that charters, on average, spend less on instruction than public district schools. 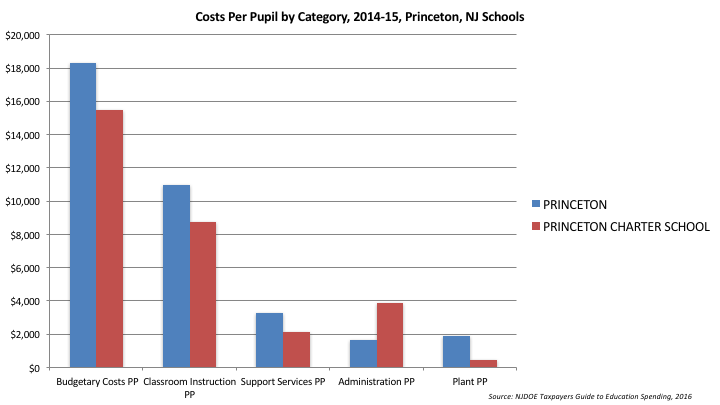 And I have shown clearly New Jersey's charter schools spend far more on administrative costs and far less on student support services than their public district hosts. 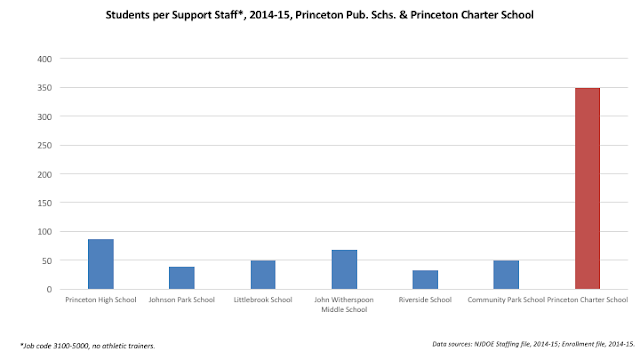 Keep in mind these support costs are for the services special education students need the most; however, charters enroll, proportionally, far fewer of these students than the public district schools. Charter schools are, therefore, a serious fiscal burden on public schools. That is an extraordinary amount of growth... but what are the consequences? 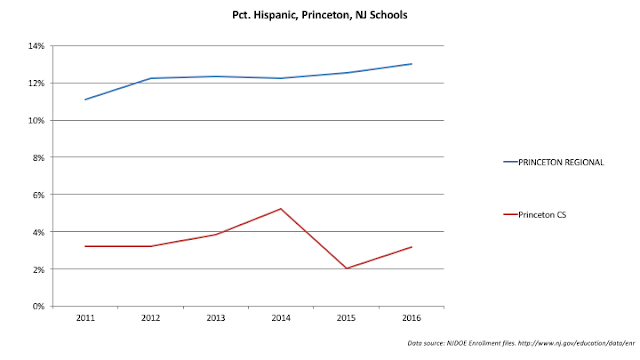 Did NJDOE ever stop to ask themselves what they might be doing to the local school districts by forcing charters on to local communities without any say? 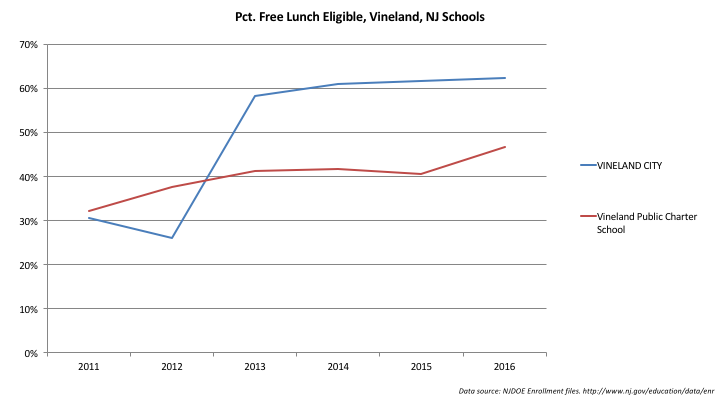 At a talk earlier this month, I pointed out that NJDOE collects a lot of data -- but they rarely ever seem to want to use it. 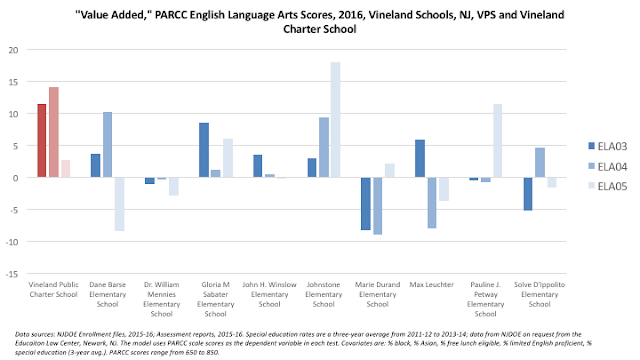 Let's correct that: let's take a dive into the data and see if we can determine the impact of this massive charter school expansion on local communities that are already suffering because Chris Christie refuses to follow the state's own law and fully fund local districts.